After a moderate pullback last week on soft US inflation readings, the US dollar has rebounded strongly this week to resume and extend its rising trend that has been in place for the past month. This strong rebound and recent overall support for the US dollar have been driven in part by rising interest rate expectations as displayed in surging government bond yields, despite tepid inflation readings within the past two weeks. This week, the benchmark 10-year US Treasury yield rose above 3.10%, marking its highest point since mid-2011. Meanwhile, the energy-correlated Canadian dollar has been helped along recently by a sharp surge in crude oil prices in the aftermath of US President Trump’s announced withdrawal from the Iran nuclear deal last week. Also last week, key Canadian employment figures came out mixed. While Canada actually lost 1.1K jobs in April against previous expectations of an 18K increase, this disappointment was somewhat offset by higher-than-expected wage growth and a rising percentage of full-time workers versus part-time workers. Looking ahead, Friday brings more key economic data readings out of Canada, with both the consumer price index (CPI) for April and retail sales numbers for March scheduled to be released. Consumer inflation is expected to have remained steady in April at +0.3%. March retail sales is also expected at +0.3%, while core retail sales (excluding automobiles) is expected at +0.5% after the previous month’s disappointing flat reading. 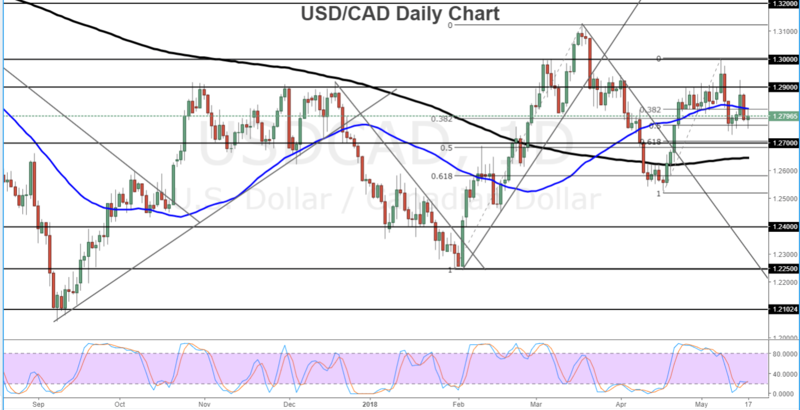 Ahead of these important Canadian data releases, USD/CAD is generally still in the midst of a pullback from last week's high just short of the 1.3000 handle, a key resistance level. In the process, the currency pair has dropped back below its key 50-day moving average. The next directional move for the pair will be driven largely by Friday's Canadian data releases, crude oil prices, and whether the US dollar remains in surge mode or begins to lose momentum. As the US dollar has been technically due for a pullback, any stronger-than-expected Canadian data on Friday could result in a further drop for USD/CAD. In this event, the next major downside support barrier lies around the 1.2700 area. Any breakdown below 1.2700 could open the way for further downside towards the 1.2526 low of mid-April.